ECO Solutions products are Innovative and World-leading. Eco solutions is a family-run firm from the South West of England. In an age where many industries are large scale conglomerates, or are not actually producing anything, DIY Doctor has always been pleased to have links with them, and have continually endorsed their products. Eco Solutions’ products were developed in partnership with the Bristol University Science Department. Their products are distributed throughout the UK and Europe and, by means of a Technology Transfer Licence Agreement, they are also available in Canada and the USA. So they are truly a modern success story. The company were pleased to have their assertions backed up following an investigation of their products by the Advertising Standards Authority (ASA) after they received a single complaint from a member of the public about a claim made on their website that their technology is both innovative and world-leading. Eco-Solutions is a world-leading technology and innovations-driven company that has developed internationally patented leading-edge water-based paint strippers, coatings removers and associated products. Eco Solutions is dedicated to providing safer and eco-friendly alternatives to hazardous solvents for use by consumers, as well as in a variety of applications across different industries. We have the most hands-on experience of paint removal since 1978. “Eco Solutions is a world-leading technology and innovations-driven company”. Obviously the concerns had to be checked out by the ASA, and they are satisfied that Eco Solutions are quite right to make the claims they do, and that their statement was not in breach of the CAP code. MP for Weston-Super-Mare John Penrose was pleased to congratulate Eco Solutions CEO Ivor Chivers. 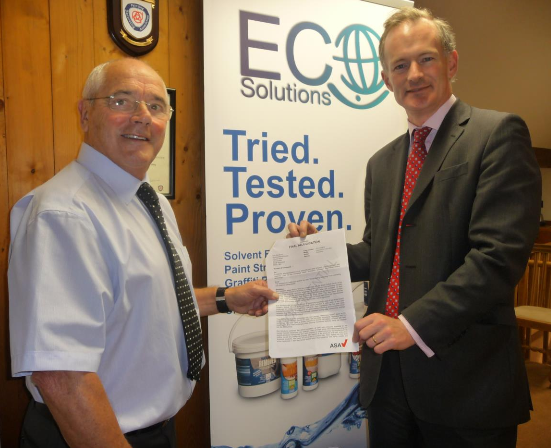 Penrose has been a long-term supporter of Eco Solutions’ drive to ban harmful paint stripping compounds. He assisted them with the Health & Safety Executive in respect of the ban on toxic paint strippers that contain dichloromethane which are now banned in the UK, and which were withdrawn from sale to consumers in 2011. The range of products in the Homestrip and Tradestrip ranges include products that remove graffiti, Artex remover, paint stripper and Upvc cleaner. Visit the ECO Solutions Website to see a full range of their DIY products. All of the utilise natural process rather than harsh stripping agents. This makes them kinder to the environment and to the user. Check out our project on removing Artex here. Ivor Chivers says “As a small family company, we continue to work closely with many other companies and organisations in the South West to make our innovative technology world-leading and source our needs, wherever possible, in this region”. DIY Doctor thoroughly approves of the work of the ASA and is pleased that consumers have somewhere to go when they have concerns over the claims of anyone advertising their goods, products or services. In this instance we are pleased that the complaint was proved to be unfounded, but if you have concerns about other companies claims you can find out more about raising your concerns with the Advertising Standards Agency here.